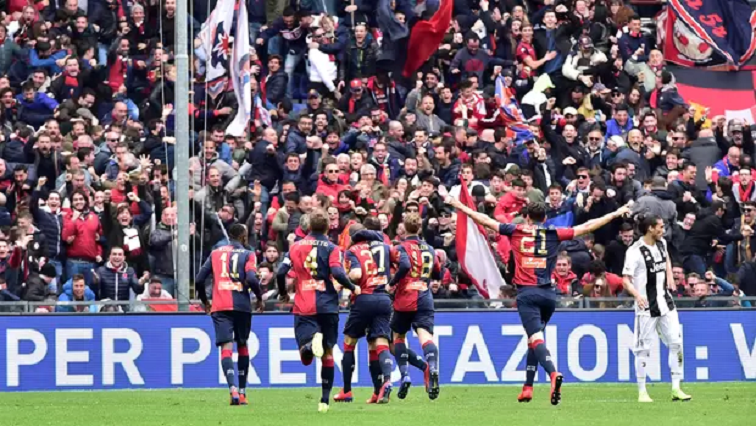 High-flying Juventus crash back to earth with Genoa defeat - SABC News - Breaking news, special reports, world, business, sport coverage of all South African current events. Africa's news leader. Genoa's 2-0 victory ended the Juventus's unbeaten run in Serie A.
Massimiliano Allegri conceded that the win in Turin had taken its toll even if his side still remain 18 points clear on the top of the table before Napoli’s game against Udinese later on Sunday. “It’s not a tragedy, but I’m sorry because we wanted to remain unbeaten. The Champions League match certainly weighed heavy…You can’t play all the games at your maximum….”In the first half, we risked conceding a goal twice, while we did better in the second, when they dropped a little bit, but we conceded goals and gave away the second straight after the restart. A defeat could have happened (at any time) and it is better that it happened today, now we will have time to rest, recover our energy and the injured players,” said Allegri. Juventus had won 24 of their 27 previous matches in Serie A this season with three draws, including a 1-1 stalemate against Genoa in the reverse fixture in Turin. It was the first league defeat on Allegri’s side since April 2018 against Napoli, and first away since losing at Sampdoria in November 2017. “The defeat could do us good because maybe we thought we already had the league in our pockets and instead we still have to get five victories. Much like the Coppa Italia defeat to Atalanta, we picked the right game to lose, because it’s just before the break for international duty, so we have time to unplug and rest,” continued Allegri. “I’m happy for him (Sturaro) because he suffered a lot and today he changed the game,” said Allegri of the midfielder who was loaned by Juventus to Genoa in January, a deal then made permanent in February. “It has been a difficult year for me. I’m still a long way off match fitness and this really couldn’t have been a better gift. This has to be the boost we need, because Genoa are largely a young squad, but with solid foundations,” said Sturaro, who had been on loan for a season at Portuguese club Porto but did not play any games before returning to Italy. Napoli, meanwhile, can cut the gap on Juventus to 15 points when they host Udinese on Saturday, with AC Milan, in third, playing city rivals Inter Milan, in fourth, at the San Siro. Roma, are fifth, three points off the Champions League places after a 2-1 defeat to struggling SPAL, with Lazio two points behind in sixth following a 4-1 win over Parma in Rome. Atalanta are equal on points with Lazio after being held 1-1 by bottom club Chievo. This entry was posted on 17 Mar 2019,06:30PM at 6:30 PM and is filed under Sport. You can follow any responses to this entry through the RSS 2.0 feed. Both comments and pings are currently closed.